There will be 4 FREE Learn-to-Skate sessions offered at the Empire State Plaza this winter, with the first starting next Saturday. Sessions will be at 9:00 AM and 10:00 AM and you must register in advance (I did not see age ranges listed but did sign up my children!). Free skate rentals offered to participants. Presented FREE by BlueShield of Northeastern NY and hosted by the Hudson Mohawk Figure Skating Club. Learn more and sign up HERE. 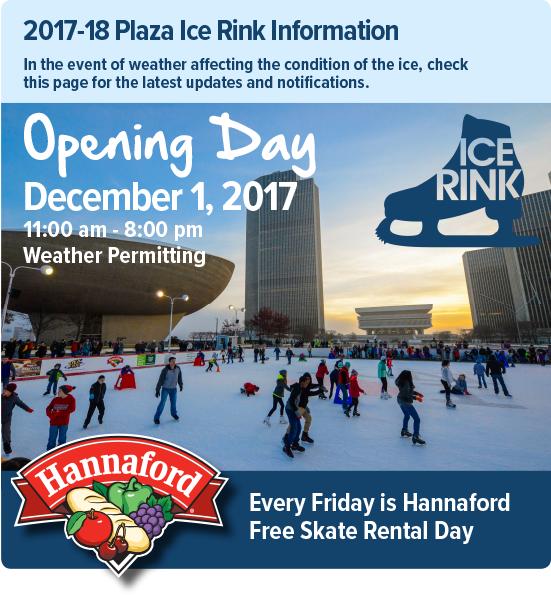 The ice skating rink opens on December 1st and every Friday is free skate rental day, spsopored by Hannaford! This entry was posted in Capital Region Deals, Freebies, Kids. Bookmark the permalink. ← Lunch with Santa at Proctor’s This Saturday!